Olympic Rings and Other Things: One Year Until Rio ... BINGO! August 5, 2015, marks the "one year to go" milestone for the Rio 2016 Olympic opening ceremony. 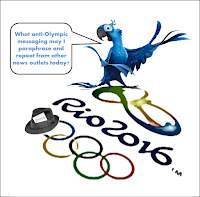 In step with -- or maybe a pace ahead of -- the standard Olympic reporting playbook, a news outlet or two already dropped their Rio preview stories as early as mid-July. Many more will follow during the next week. In fact, as I typed this blog entry, the Associated Press distributed their one-year-out summary already picked up stateside and in Singapore. Predictably, these one-year milestone reports skew negative. 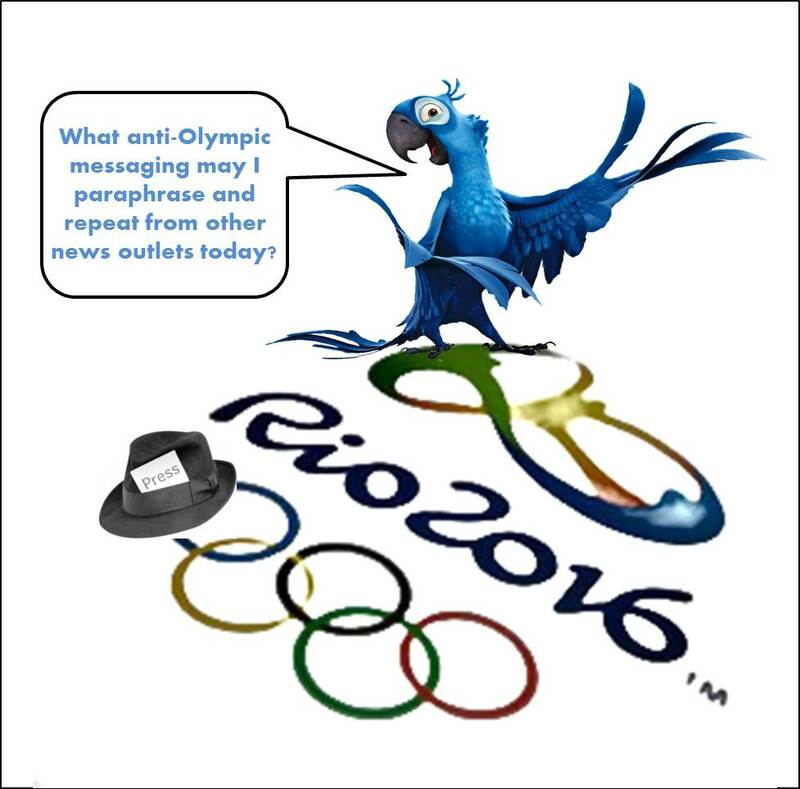 Olympic news understandably isn't "news" without a cynical tone or a steady drumbeat of "CON-TRO-VER-SY ... CON-TRO-VER-SY" and click-bait headlines stirring the pot. Too often the remarkable stories of athletic feats and organizational successes are brushed aside for the easier angle of perceived problems on the horizon. I concede, many pre-Games issues are real. But most of the challenges of hosting a global sports festival do not rise to the life or death threshold some news outlets would have their viewers or readers believe. In anticipation of this year's crop of anti-Olympic rhetoric and various outlets/reporters parroting each other, some friends and I came up with a new twist on a traditional, popular game. We present for your reading and social media sharing pleasure ... Olympic Buzz Word Bingo. Buzzword Bingo (a.k.a. bullsh*t bingo) shares an interesting heritage rooted in traditional bingo cards. My own introduction to the buzzword bingo concept arrived via Dilbert by Scott Adams (see sample below). It remains a mystery as to which, and whether, former managers knew who played this game in the halls and conference rooms of the P.R. agencies where I worked over the years. 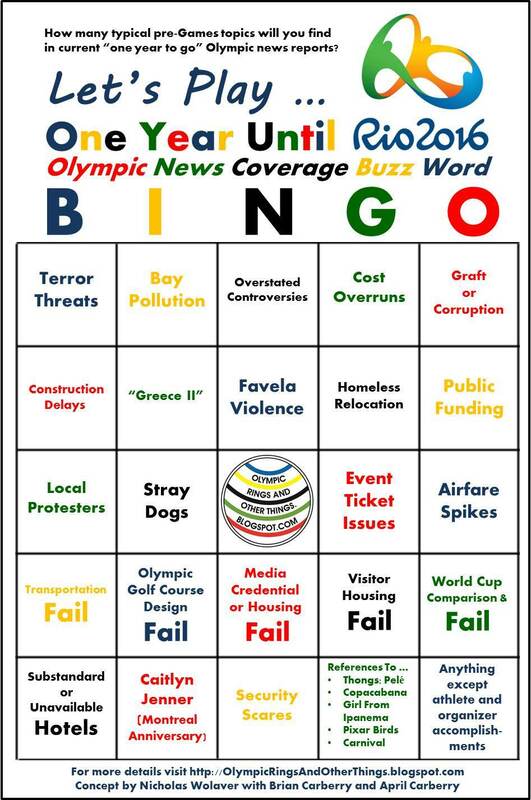 Reading last week's Olympic countdown story distributed by Agence France-Presse inspired our five-ringed version, and you're invited to play along and please share the bingo card at the base of this post. Go ahead and try it out! The aforementioned AP story almost creates a blackout Olympic bingo card! This game is also intended to help throw stones at what I perceive to be NBC's regular Olympic roll-out of scare tactics designed to encourage viewers to keep their butts on the couch instead of on planes to the Olympic host city. Far too many people fell for the anti-Athens and anti-Beijing Olympic Fear Factor messaging, and they missed quite a party in both cities. The Olympic terror threat level reached high enough crescendos in 2008 that even The Onion spoofed Tom Brokaw, Bob Costas and John Tesh pre-Games scare tactics (or in the case of Tesh, his over-the-top gymnastics commentary). I, for one, hope fewer people will believe the anti-Rio hype and book passage to experience and enjoy Brazil. Rio 2016 in 365 days ... it's going to be a great event! Cartoon via Dilbert.com. Thanks also to this site for 'Blu' bird image and this site for 'press' hat image used in illustration created by N. Wolaver. 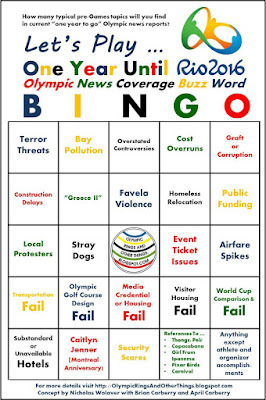 Please download and share this bingo card with your favorite Olympic reporter. Fun for all!